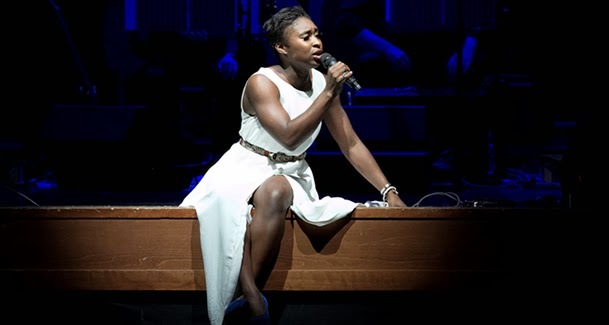 AS THIS INTERVIEW IS PUBLISHED, CYNTHIA ERIVO HAS JUST PERFORMED AT BUCKINGHAM PALACE IN FRONT OF HER MAJESTY THE QUEEN! This time last year Cynthia Erivo was a hard working actress, recently out of playing Deloris Van Cartier in Sister Act’s UK tour. Fast forward 12 months and as 2014 dawns she has been nominated for two of the country’s most celebrated theatre awards, is amongst the headliners at next week’s What’s On Stage (WOS) Awards ceremony and is shortly to open at the Palladium in the Simon Cowell / Harry Hill X-Factor comedy musical I Can’t Sing. So, what has happened in the past 12 months? Three words: The Color Purple. 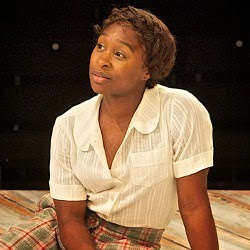 In a production staged with beautiful simplicity, for two months, eight times a week, this perfectly poised, gorgeous young actress held the audience at London's Menier Chocolate Factory in the palm of her hand as she told the story of how Celie the story's heroine, triumphed over incredible odds to make an inspirational success of a tragic life. Audiences sobbed and such was the intensity of her delivery that a standing ovation half way through the second act became a regular feature of the run. Nominated for that performance in both the Evening Standard and the WOS awards it has been a truly remarkable year for the RADA graduate. Taking time out from I Can't Sing's gruelling rehearsal schedule, we meet for tapas on a blustery night in Waterloo where over green tea and calamari, Erivo tells me of her whirlwind year. JB: Tell me how The Color Purple came together for you. CE: Celie is a role that I have dreamed of playing since I was ten. It is one of the most rounded roles ever written for a black female in either in theatre or in film and I love the grit that’s in her character. I was already off the page with my audition pieces so working with director John Doyle was both challenging yet relaxed and I felt as the recalls went by, that at each step he was getting to know more of me and how I work. At the time I was appearing in Craig Adam’s new musical Lift, at the Soho Theatre and I was so lucky to go straight from that show into The Color Purple. JB: Celie is told by her abusive husband, venomously: “…..You’re poor, you’re black, you’re ugly, you’re a woman….” – Aside from the fact that you are not an ugly woman, how did you tackle the challenge of the role? CE: I started out from the belief that Celie’s ugliness came from within, from her own sense of low self worth, that it was more to do with her not recognising her own beauty, rather than a promotion of her being ugly. We experimented with wigs and make-up to portray both that ugliness and also her ageing, but eventually, working with John, I chose to portray these challenges through how she carried herself. I thought a lot about Celie’s gait and how that would evolve both with her emancipation and also her ageing. JB: At what stage into the show’s life did you and the company realise that you had created something special? CE: We were blessed with a standing ovation right from the start. But very early on, fear kicked in and I found myself thinking “I don’t want to lose this feeling”, so in each performance I would focus upon the concentration and above all the consistency that playing Celie demanded. I was so proud that the show attracted an unconventional audience that would have people shouting at me “You go girl!” as Celie finds her resolve. 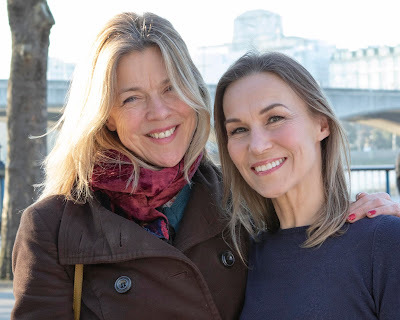 Back in Shakespeare’s day the audience would shout at the actors and it was just so rewarding to have reached out and made such a strong connection. I could look around the theatre [the Menier only seats around 200] and see and hear people sobbing, passing tissues. When I came out into the foyer each night there would be women with make-up running, bankers, my sister “who never cries at anything” simply in tears. JB: Your friend and colleague Sophia Nomvete (also nominated by WOS for Best Supporting Actress in the show) has described you as being an incredibly supportive team player, who notwithstanding all your responsibility on stage, is still a big kid in the dressing room. Apparently you would bring in healthy food and snacks each day, but then promptly graze on other people’s crisps and chocolate! CE: She’s not wrong I do focus hard on fitness and healthy eating, but I just can’t resist Haribo and I've a real weakness for Marks and Spencer’s Percy Pigs! JB: Halfway through the run of The Color Purple, New York composer Scott Alan flew into London for a one night concert at the O2. The gig featured a star-studded lineup but for many the highlight was you singing Anything Worth Holding Onto, Scott’s scorchingly autobiographical song about the pain of depression. Alan has told me how difficult it was to rehearse that number, saying that it only actually all came together on the night, in performance. Is that true? CE: I guess it is. There is a part of me that can sometimes only truly explore a song when I am singing to an audience. I need to be telling the story to really be able to express myself. The day of that concert was crazy with morning sound checks at the O2, then back to the Sunday matinee of The Color Purple and finally back to Greenwich for the concert. But I knew that night, as I cried whilst I sang, that I had truly given Scott’s song the connection it deserved. CE: Wow, is that what he said? I have no words, I am so touched by his generosity! JB: The two award nominations are both predominantly celebrity driven and have pitched you against competition from much larger shows that played at the National Theatre and the West End, in venues that in one night could seat the same number of people that it would take the Menier a week of full houses to achieve. For smaller off West End shows, the awards ceremonies are often an un-level playing field, so to have achieved a “podium finish” twice in one year is an incredible achievement. The Color Purple was refreshingly free of all gimmicks, earning its plaudits entirely through the outstanding work of its acting company and for many of the people lucky enough to have seen it, those awards belong to you. That’s kind of you to say. Yes, the Menier is a small house of course, but I was simply so thrilled just to have been nominated for the role. It has been an immense honour. JB: And so to I Cant Sing. Tell me about the leap from performing in one of the most harrowing musicals, to a show that is expected to be one of the year’s funniest. CE: There’s loads that I can’t say about I Can’t Sing of course and I don’t want to spoil any surprises, but it has been an amazing learning process. The show has been written by Harry Hill and Steve Brown, two of the funniest guys around and it has been incredibly technical for me, as well as being a combination of great fun and phenomenally hard work. I am not a quintessentially funny comedy actress, so I have really enjoyed discovering my comedy timing. JB: And what of your fellow cast members? CE: I am learning so much from them. Nigel Harman of course has already mastered comedy in musical theatre with his Lord Farquad in Shrek and he is wonderful to work with. It is a large and above all very talented and experienced cast that I am so proud to be a part of. JB: And looking beyond London’s musical theatre, what inspires you and what would you like to see on your horizon? CE: For inspiration, I was blown away by Adrian Lester’s Othello at the National Theatre last year. That was the first time I had set foot in the Olivier auditorium. I was there on my own, which is often the best way to enjoy theatre and I had never experienced a theatre as large as that stage, yet one that could also allow you to become so wrapped up in a production. Adrian is also a friend of mine and I am very proud of the interest that he has taken in my work to date too. As for the future? Well immediately that is I Can’t Sing of course and I have great expectations for the show. But looking even further ahead, if there was a TV series for me, well that would be just ideal!